This week Ollie and I joined Alice Parfitt and Michael Blencowe from the Sussex Wildlife Trust for an enlightening walk around the Filsham Reedbed Nature Reserve, part of the Combe Valley Countryside Park in Bexhill and Hastings. We hadn't done organised bird watching with a group before and weren't sure what to expect, but our morning out probably wasn't what you might imagine. There was no sitting quietly for hours peering out of a hide, although without small people in tow this would have been quite relaxing. What we did instead was perfect for high energy Ollie - a fantastic guided walk where we certainly weren't at much of a disadvantage for not owning good binoculars because mostly the birds announced their presence in song rather than sight. With the aid of bird songs downloaded to a smartphone we were taught to distinguish the different songs we heard and the birds themselves put on a great show, with sedge, reed and Cetti's warbler all getting in on the act. We learned about different habitats and habits of the birds and felt very welcomed and included in the group who all obviously had far more experience than us. I'm good on plants and bugs, but birds are more of a mystery to me and I couldn't tell one little brown bird from another from a book, so hearing the clear difference in their songs was really interesting. My favourite bird though was the brief glimpse of a Hobby zooming overhead chasing swifts (which it resembles - it looks like a giant swift or swallow in profile against the sky). I've possibly seen them before but without any idea of what they were. These are amazing birds - they migrate to Britain for the summer, coming all the way from Sub-Saharan Africa following the swifts and swallows that they eat. They are so speedy they can even catch dragonflies - the masters of aerial maneuverability in the insect world. We also had plenty of interest in seeing how the local landfill site is being converted into part of the country park, with part of it already covered and turfed, part with geotextile cover and methane gas exhaust chimneys visible, and part still accepting rubbish. This made for a great opportunity to talk to Ollie about why it's important to recycle, and the economics of materials that have made it more economically viable today compared with in the past. 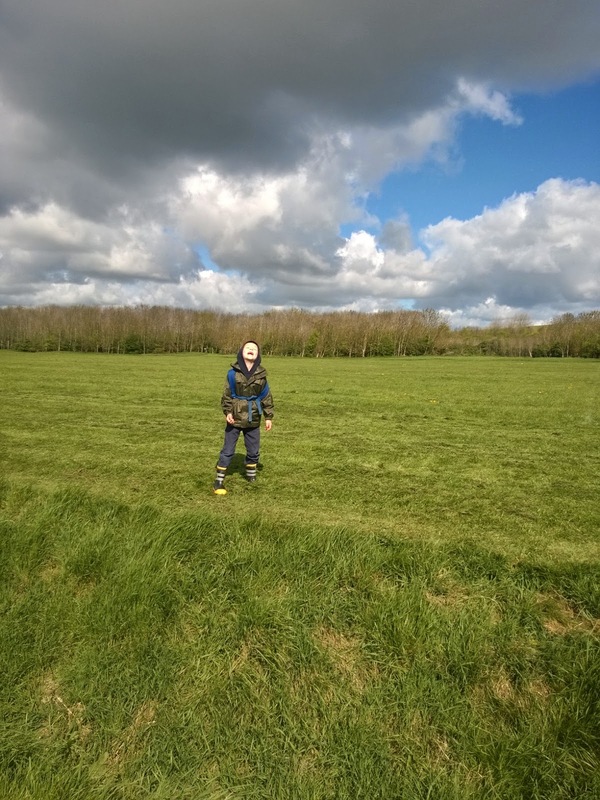 Ollie was pretty tired to start with after we had spent an hour running around on the football fields adjoining the reedbeds while we waited for the group to arrive, but even so we still had a really lovely morning. 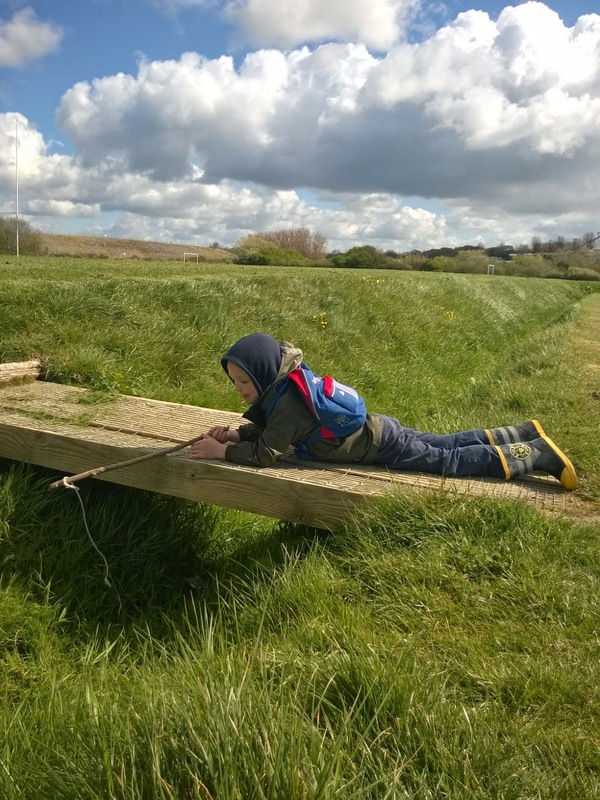 Outdoor learning is unbeatable.